Imagine this. You are struggling financially and then lose your job. You have children to feed and bills to pay, but no income. You are now facing the possibility of homelessness. You are one of the nearly 900 homeless individuals living in Summit County. So where do you go? And what do you do? The Continuum of Care (CoC), a branch of Info Line, Inc. works around the clock to help people in this critical situation. Can you imagine being homeless? Would you even know what to do or where to turn? Many probably wouldn’t know where to start, or how to find food, shelter, etc. Thankfully Info Line Inc., located in the heart of Akron, has this covered. Info Line Inc., incorporated as a private nonprofit corporation by the State of Ohio in 1975, has come to the rescue with their phenomenally categorized system and database to help sort things out for the homeless. Their one-of-a-kind system creates stability for those focusing on just surviving. What is so great about Summit County is the fact that there are so many caring and giving hearts, willing to reach out to those who need a “hand up” in society. But with that comes a slew of well-meaning but often misled groups, who can actually end up doing more harm than good. Some of these groups include faith-based missions, which the Summit County Reentry Network (SCRN) hopes to reach and teach. Some in the faith community feel it is their calling to reach out to those in prison, and genuinely want to help returning citizens. But it is lack of knowledge in this area that often sets them back. This is what the SCRN and Oriana House hope to change through education. So far we’ve discussed the gaps in the system and what doesn’t work in the area of reentry, but the question that arises now is what does work? And how can we encourage these ideas worth spreading? The Summit County Reentry Network (SCRN) and Oriana House have found a few things to be key in helping ex-offenders turn their lives around. This includes role playing, and taking the Ohio Risk Assessment System (ORAS) test, to determine their level of offense so that they can provide the best plan possible. 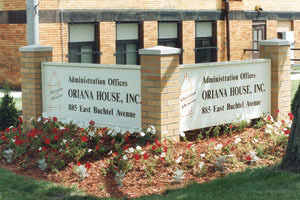 As discussed in Part One of this series, the Summit County Reentry Network (SCRN), Oriana House and others involved in the area of reentry are forming a very strong union to beat recidivism. Instead of seeing so many of the approximately 20,000 people who are released from prison each year go right back, they are discovering how to help them become contributing members of society.